I think I’ve had more tacos this fall (I realize it’s been two weeks), than I did all summer. I blame several new incomers to the D.C. dining scene, seemingly all taco joints that strike my fancy. 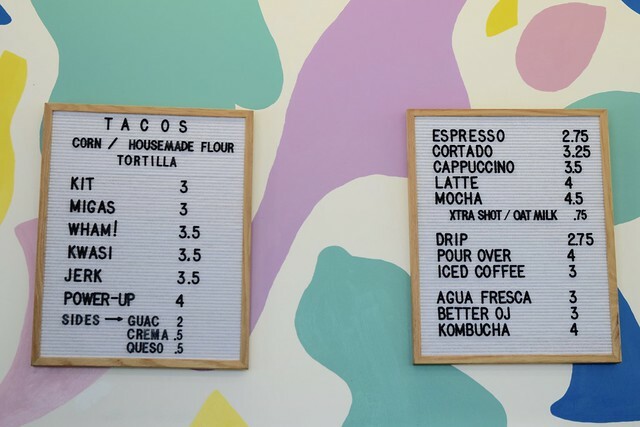 Between El Techo’s rooftop oasis in Shaw (brunch review forthcoming), Santa Rosa’s edgy vibe in Capitol Hill, and Fox Loves Taco’s playful hipster scene in the heart of Brookland, it’s a good time to be a fan of of the fold-up fare in Washington. 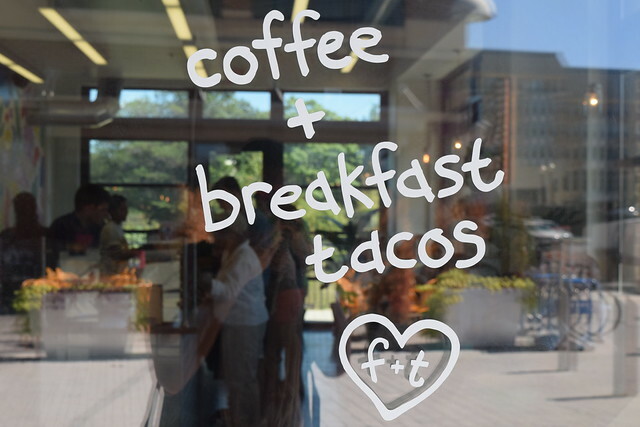 Fox Loves Taco is serving up vegetarian breakfast tacos and delicious craft coffee in an adorable shared space with the Bike Rack. It’s a one-two punch for any biker or pedestrian who needs fuel in more ways than one. 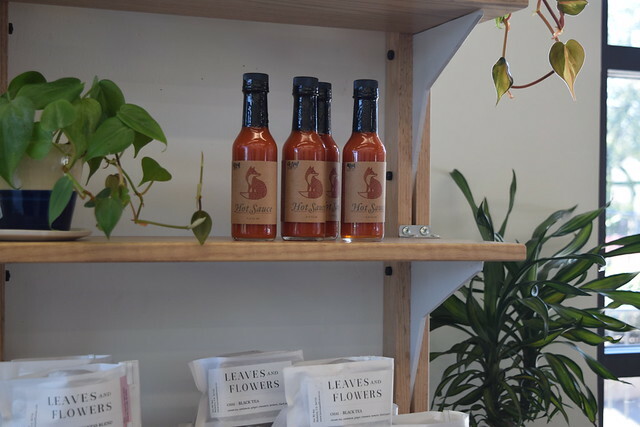 The owners hail from Little Red Fox, a coffee, sandwich, burrito, and provisions market cafe in Northwest which leads me to wonder: are these two more obsessed with tacos or foxes? 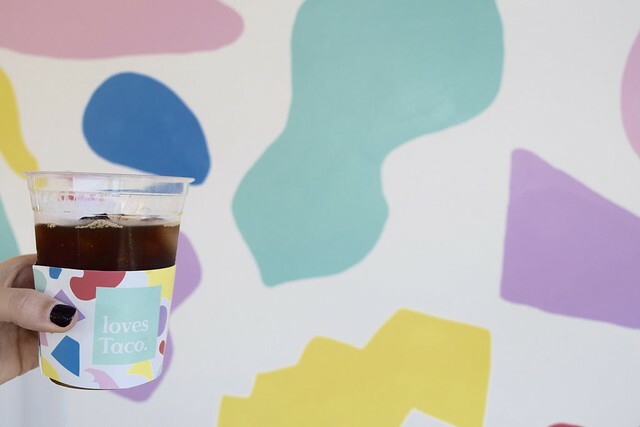 On a sunny Saturday, we entered the playful space surrounded by multi-colored shapes painted on the white walls and a small shelf of provisions from Little Red Fox, such as the housemade hot sauce. Our own beloved fox, Mojo the Basenji, was particularly impressed with the small bowl stocked with dog treats. Although, he was denied access to the shop, due to health codes. I’m a coffee purist, so I went with a black cup of iced joe. The menu is simple and served all day. 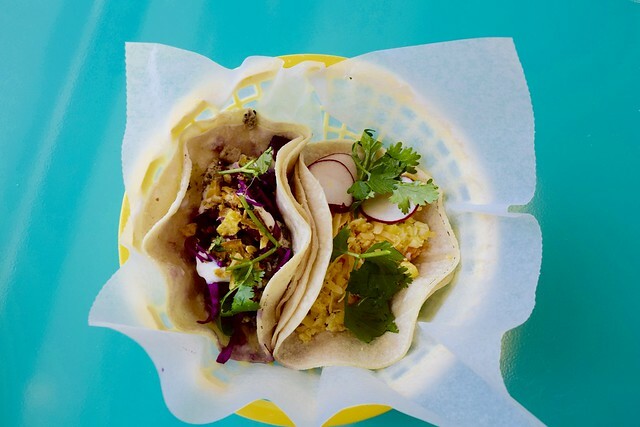 All six tacos sound tempting, so long as you’re into vegetarian fare and tofu scramble. The first decision you’ll have to make is if you want a flour or corn tortilla. I prefer the latter, as would those with gluten-free diets. We debated between the Wham! and the Migas. Ultimately the Wham! sounded delicious, but a bit too messy with a poached egg as the main protein. I had yet to finish my first cup of coffee, so that option seemed out of my consumption range for the time being, plus there were no tables available inside to really dig in. We went with the Migas which was the perfect breakfast taco with scrambled eggs, crumbled tortilla chips, cheddar, radish, and cilantro. The second taco we tried was off the beaten path. Bursting with purple cabbage, the Jerk was a combination of marinated tofu topped with plaintain gremolata and lime creme. It was a generally creamy taco, so I appreciated the crunchy texture of the cabbage. I would order this one again, but fair warning it’s certainly a unique taste for breakfast! 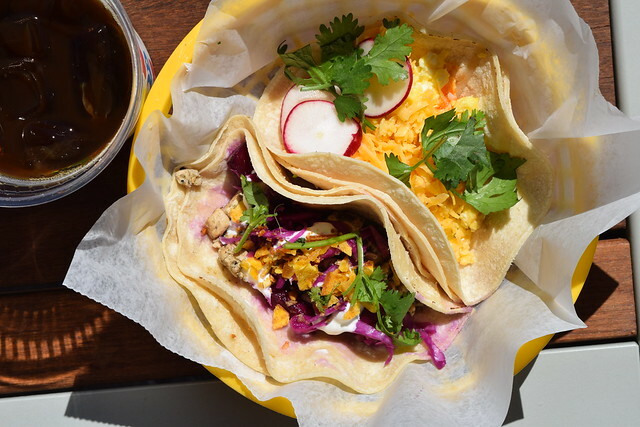 If we lived in Brookland we would be regulars at Fox Loves Taco. If this isn’t your ‘hood, jump on your bike and head in for a late breakfast, while your bike gets a tune up. If bikes aren’t your thing, plan to stroll the adorable art walk, home to several local artist-owned shops. And if this is your ‘hood, we’re jelly.